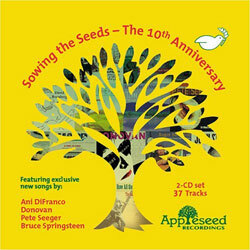 Features Bruce Springsteen and Pete Seeger on a new recording of "The Ghost of Tom Joad"
Appleseed Recordings, home of Springsteen's original release of "We Shall Overcome," celebrates its first decade with a 2-CD, 37-track sampler including exclusive new recordings by Springsteen & Pete Seeger (their first-ever collaboration), Ani DiFranco, Donovan and more. Established in 1997 to "explore the roots and branches of folk and world music and sow the seeds of social justice through music," the independent label has released 85 CDs so far that present new music by folk giants such as Pete Seeger, Tom Paxton, Donovan, David Bromberg, Al Stewart and Eric Andersen, ascendant talents like The Kennedys, Tim Eriksen, and Lizzie West, and has attracted guest artists Springsteen, Jackson Browne, Judy Collins, and many more. Sowing the Seeds - The 10th Anniversary is Appleseed's first sampler and captures many of the label's highlights, as well as nine new tracks recorded specifically for this birthday celebration. The 2-CD set is split into two "themed" discs of new and old songs by a veritable Who's Who of socially aware musicians. Disc 1, "And Justice for All," features politically charged songs that were among the first to confront the Iraq War and the Bush Administration, as well as addressing economic hard times, the environment, and other sociopolitical issues. There are classics from the Appleseed catalogue like Pete Seeger's "Bring Them Home (If You Love Your Uncle Sam)" with guests Billy Bragg, Ani DiFranco, and Steve Earle; 9/11 meditations by Tom Paxton and Lizzie West ("19 Miles to Baghdad," a recent "Democracy Now" radio/TV favorite); and a Latin-flavored Jackson Browne & Joan Baez duet. New songs here include the first collaboration between Bruce Springsteen and Pete Seeger on Springsteen's "The Ghost of Tom Joad," Ani DiFranco's blistering take on Seeger's "Waist Deep in the Big Muddy," Donovan's re-recording of his 1965 hit, "Universal Soldier," and four new Pete Seeger tracks, including "The Ross Perot (George Bush) Guide to Embarrassing Questions." Sowing's second disc, "Love Hope and Appleseed," presents a somewhat broader selection of themes and styles. The CD features songs of optimism, perseverance and meditations on love. There's folk-rock from both sides of the Atlantic by Al Stewart, Donovan, The Kennedys, and John Stewart. There's traditional acoustic folk from ex-Byrds leader Roger McGuinn, David Bromberg, and Tim Eriksen. Other artists include Eric Andersen with guest Lou Reed, Judy Collins, Pat Humphries (her classic "Swimming to the Other Side"), and more.